Northeast Flooring Solutions offers concrete floor grinding as part of our concrete floor preparation for seamless floor installations. The process of floor grinding uses ride-on or walk-behind machines as well as handheld grinders to further prepare concrete to receive a new flooring system. Grinding cleans the concrete surface by removing a small layer of material. It flattens and smooths surfaces, levels out high spots, removes coatings, mastics, epoxies, urethane, adhesive residue and paint. Large floor grinding machines use multiple rotating discs to remove paints and concrete coatings and to create light texturing of the concrete surface in large, open areas. Like shot blasting, grinding increases the concrete surface profile to improve the bonding properties of a newly applied resinous flooring. The latest addition to our grinding equipment line up is a propane-powered floor-grinding machine, the CPS Rover. Unlike plug-in models, the propane-powered unit provides complete mobility without the any reliance on or restriction of a power source. It’s a game changer on job sites where limited power can delay or stop a job altogether. When combined with our HEPA filtered vacuums , grinding dust and debris is minimized for a cleaner work environment. Floor scarifiers, also referred to as surface planers, also even out large surface areas with multi-tipped wheels that pound the surface. Handheld grinders help resurface areas where grinding machines and scarifiers can’t reach. All these grinding machines and devices replace hand scrapers, jackhammers or chisels for faster, safer and more accurate floor preparation. 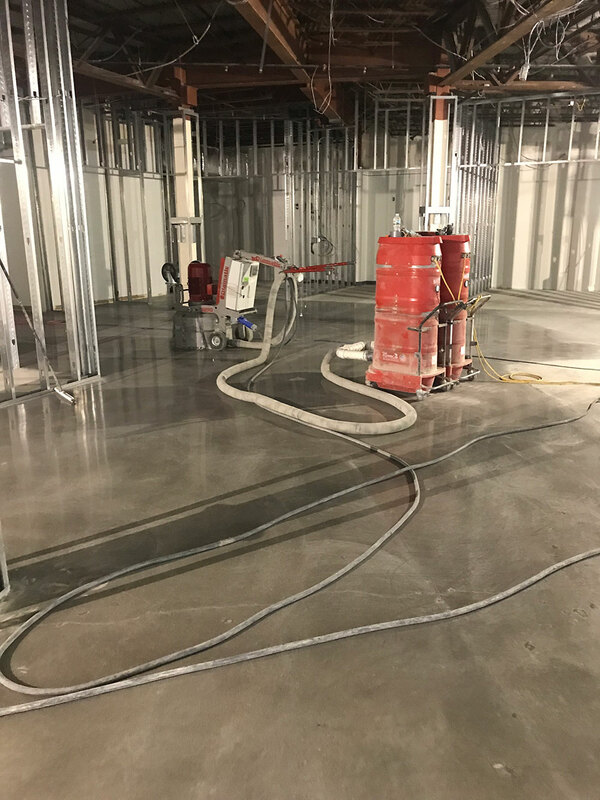 Surface preparation of existing concrete floors is a necessary part of a new floor installation, and grinding may be included as part of the process alongside removal, shot blasting, moisture mitigation, and self-leveling. Grinding is included as part of our prep for flooring installations when needed, or can be contracted independently. Contact us for details.